Recently restored to its former glory, this 17th century comfortable manor – Mas – nowadays offers a vast variety of facilities for those who would like to enjoy the French cuisine, (take on) painting, playing a round of golf or just take a little retreat from every day life. This house offers everything for a lovely week(end) vacation under the blue French skies of the Côte d’Azur. Its location is 7 from the sea, and at 2 minutes walking distance you will find restaurants, bars, cinema. 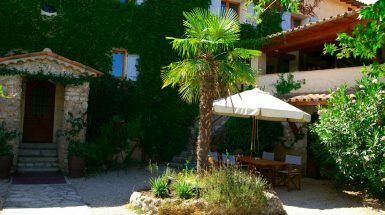 This lovely, privately owned house, is situated in the golden triangle between the cities of Cannes, Nice and Grasse. Three luxury apartments and five well-equipped rooms with adjoining terrace are at your convenience. The house offers luxury facilities like a large swimming pool, a well-maintained large garden, outdoor bar and kitchen, a characteristic lounge with open fireplace. All aimed at serving you with the utmost privacy and comfort. 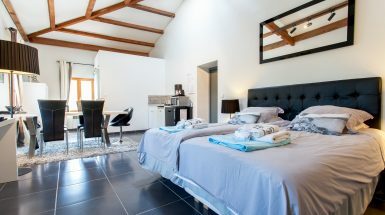 Rooms bookable per night, no cancellation costs till 2 days before arrival. 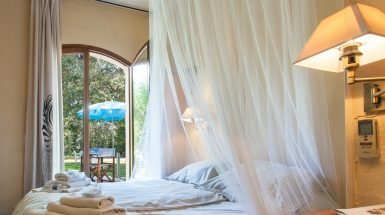 All rooms have airco/heating , free wifi, parking, private bathroom, fridge, hairdryer, watercooker, flatscreen tv, espresso machine and private terrace with chairs table and parasol. Prices of rooms are per day including daily refreshment , linen and continental breakfast. 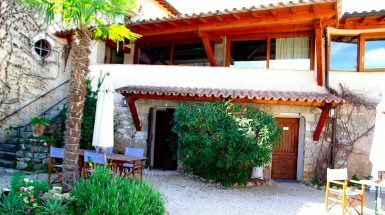 The apartments suiting two to four persons can be booked per week, from saturday till saturday between 11/6- 9/9 high season. 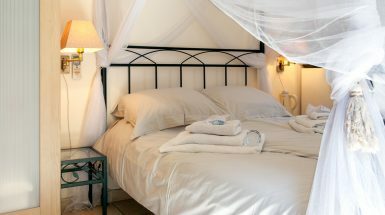 They can be booked for three nights minimum in the low and middle season. The ground floor apartments have their own entry, bathroom, kitchen and terrace. On the second floor there is a more luxurious apartment from 2 to 8 people with small kitchen, flat screen television, wifi, bathrooms with shower and jacuzzi. 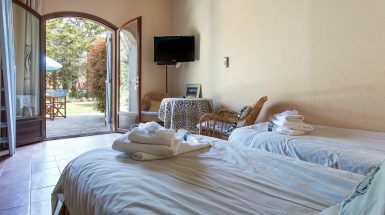 Prices of apartments are per day including linen and cleaning end of the stay. Here you will find the fitness area as well, where you can work out or have a massage on demand. Even a personal trainer is available on demand. 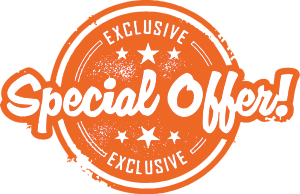 Facilities can be booked in various ways Per night you can book a room with continental breakfast buffet included, served from 08.30 – 11.30 H . Directly on line with your credit card or with downpayment of 30 % by bank. A brand new attractive village centre is within 2 minutes walk ,with 5 restaurants, wine bar, sushi bar and a cinema. Your hosts have several gentile dogs and cats, so other pets are only allowed in the apartments downstairs and with approval of the house owners. Mas Shabanou is also a first class location for organising seminars, meetings en group arrangements , weddings, incentives, workshops and so on.